When you spend as much time in the saddle as World Champion Tom Boonen does, only the best shorts in the world will do. He chooses Vermarc, shouldn't you? U-panel cut has been refined with input from the pro peloton for the perfect fit. 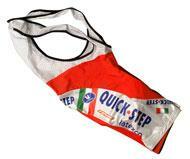 Mesh bibs keep you cool on the hottest climbs and during the hottest competition. 3D-OF pad - The 3D-OF pad is a lightweight one-piece insert without seams. Its polyester micro-fiber cover material is bonded to a layer of padding through the OmniForm high frequency process. This new process eliminates hard edges and stiff areas caused by heat in standard molding processes. The thickness of the various parts of the chamois has been carefully studied to conform perfectly to the anatomy. Finally, an anti-bacterial treatment is added to inhibit the growth of harmful bacteria.